Back in May of 1985 I was still just a kid and easily frightened by thunderstorms. So on the afternoon of the 31st, when I was out playing with my friends and the skies turned an sinister yellow and green, I jumped on my BMX and pedaled home as fast as I could. My fear only amplified at home, when my mother nonchalantly suggested that my sisters and I “get a board game and go play in the hallway,” which was basically right smack in the center of our house. Meanwhile, I secretly watched as my visibly worried father paced over by the window listening to KDKA AM on his transistor radio. The next thing I know my mom suggested we go down to the cellar and “play underneath the ping-pong table.” It didn’t take a genius to figure out something was wrong. As it turned out, several tornadoes would hit our area that night, killing three and devastating many of the surrounding towns. Luckily, ours was spared. Fast-forward to a few nights ago. We were enjoying a quiet evening with the kiddos when an alert came over my wife’s cell phone that our county was under a tornado warning. I have to add here that meteorology is somewhat of a hobby of mine — yes, I’m a dork — and in seconds I was enthusiastically watching the incoming storms via my phone’s weather app. Honestly, I was looking forward to a good, strong, late-season storm. That said, being a father, I also understood I had a responsibility to make sure my family was safe. So when my wife suggested we all go down to the basement to wait it out, I didn’t argue. Over in one corner of the basement, my wife and the kids sat on the floor playing a game of Yahtzee. Meanwhile, just like my dad three decades earlier, I was peering out the window and listening to the radio for updates. 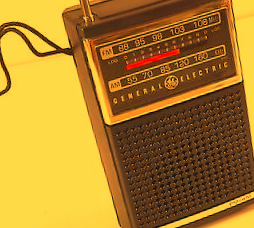 Just this time instead of a transistor radio, I was holding my smartphone, watching the radar and trying to identify “hook” echoes on the radar. Told you I’m a dork. At one point I looked into the other room and noticed the concern on my daughter’s face, much like myself 30 years before. “Is Daddy scared?” I heard her whisper to my wife. No, I wasn’t scared. Concerned, maybe. Much like my father before me, I was just trying to stay on top of things and make sure my family was safe. Thankfully that night there was never any tornado. And as for the “severe thunderstorm” they said was heading our way, it pretty much turned out to be a dud. Oh, well. Life’s funny. One minute you’re a nervous little kid looking to your dad for protection, the next thing you know you’re the dad with your own scared little kids. Hopefully my kids won’t end up repeating other parts of my personal history. Like, say, when they go to college. 4 Responses to "A Twist(er) of Fate"
I too remember where I was with the first tornado you mentioned. Flashbacks to the past seem to come when we are experiencing something similar in the present. I vividly remember the 1985 tornado. I was 5 years old and was visiting my grandmother up on Tusca in Brighton Twp. I’ll never forget my grandmother and mother yelling at my grandpap, my stepdad, and myself to get to the basement. But instead, we were too enthralled with watching out the kitchen door. I remember like it was yesterday, every time a flash of lightening would strike, you could see the large tornado off in the distance towards the hospital. I grew up on Oak Hill in New Brighton just a few miles from Spotlight 88. Luckily our house was spared. But to this day, because of that very night, I’ve been absolutely enamored by the weather. In fact, my bucket list includes a tornado chasing tour of the southern Midwest. Thanks for sharing your experience!